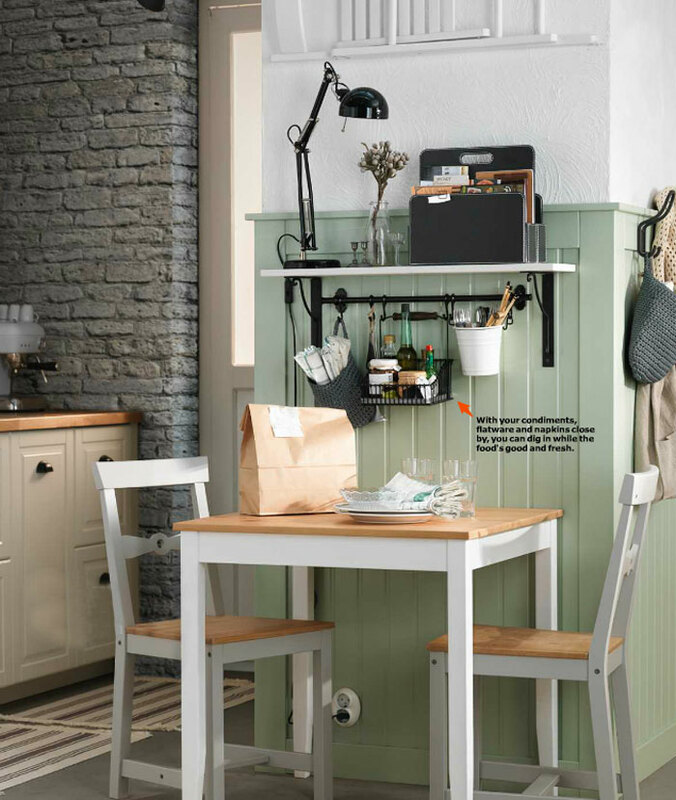 With the new 2016 IKEA catalogue hot off the press, and as tradition holds, it's always fun to find what cool decorating tricks and ideas are hidden within their pages. 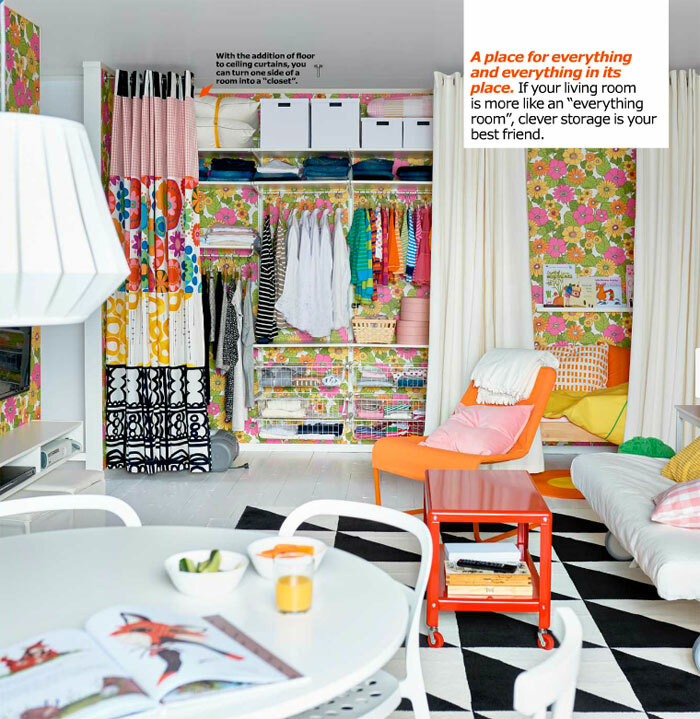 It always takes a few flip-throughs to catch them all (little nuggets to be uncovered, stylist tricks and ideas to bookmark), here's some finds worth a mention. 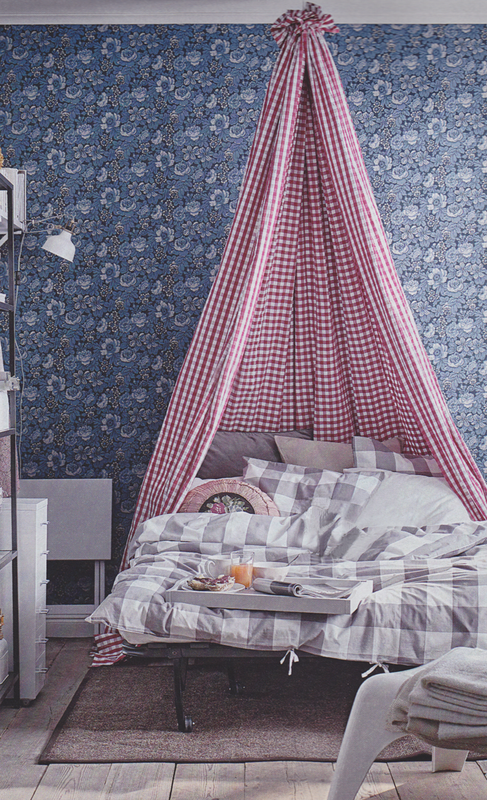 Love this fabric idea to create a little cozy and private bedtime nook. (Fabric - BERTA RUTA). The sofa below becomes the bed (above) at night using adaptable, movable furnishings. (LYCKSELE LOVAS sofa bed). No trick here, just a cool curtain rod set find. 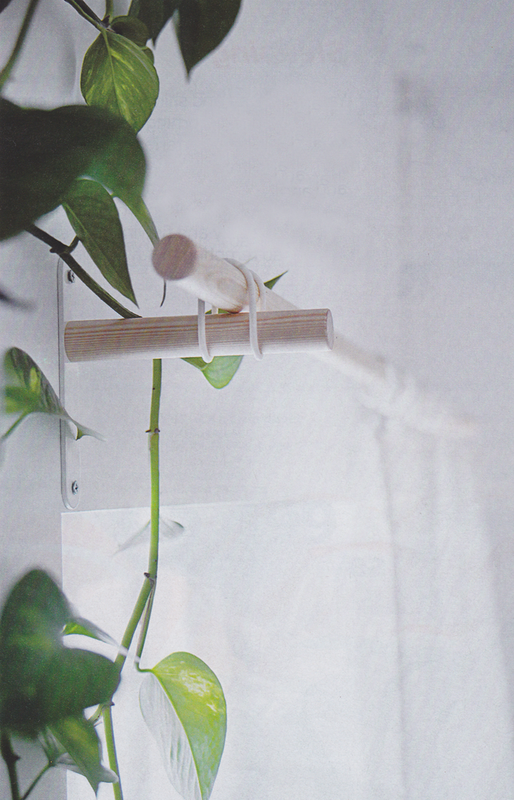 (SANNOLIKT curtain rod). 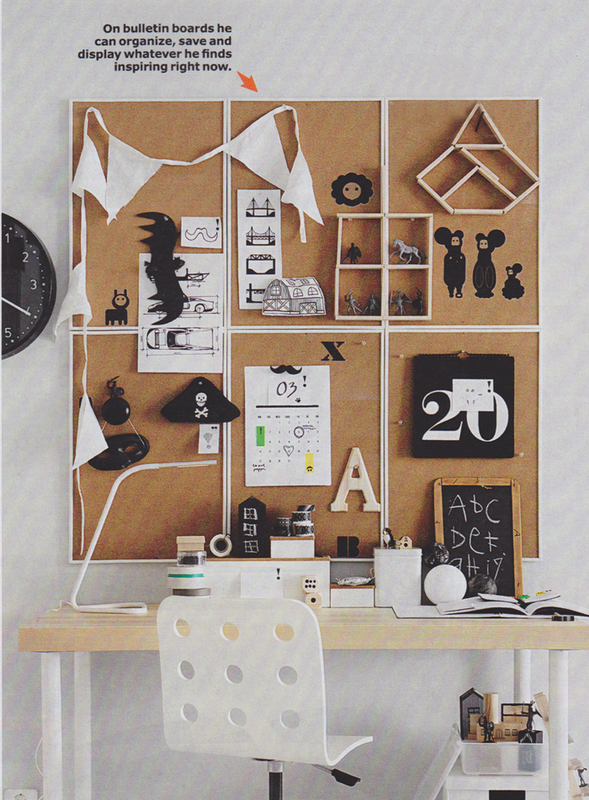 Create one big notice board out of several small cork boards. (VAGGIS noticeboard). 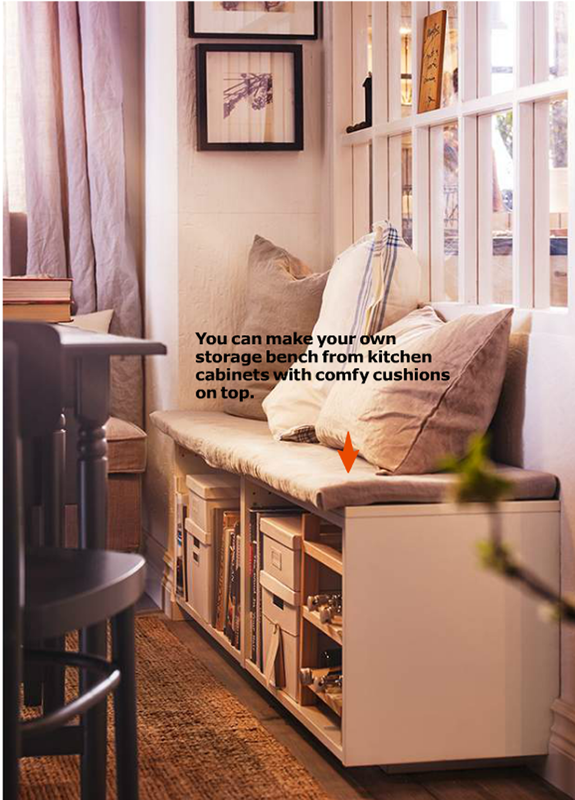 Make a storage bench to create a cozy banquette in your dining area using kitchen cabinets and comfy cushions on top! 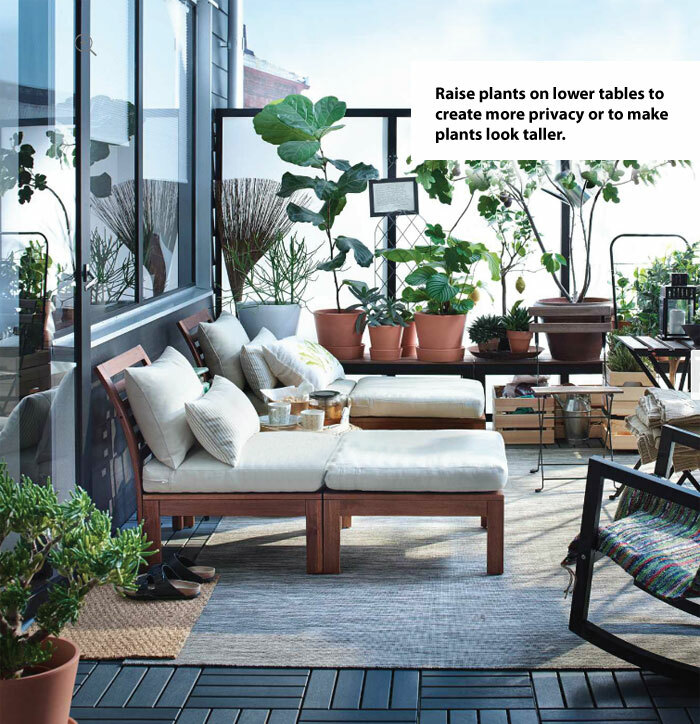 Make plants look taller or create more privacy by raising plants on lower tables indoor or out. 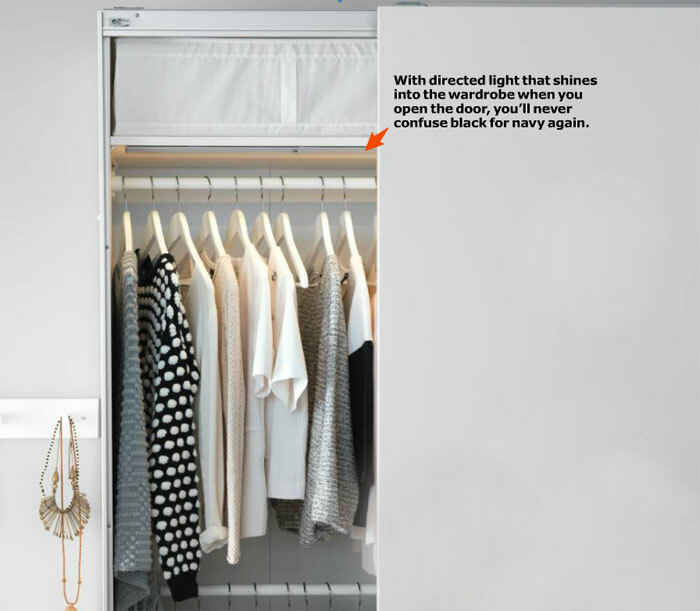 Put some light on the situation (your closet) to help the confusion of what's black and what's navy. 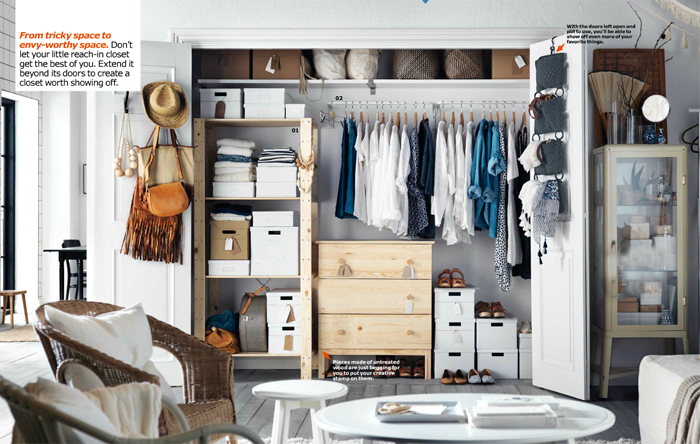 Leave your closet doors open and put them to use to showcase your favorite things. 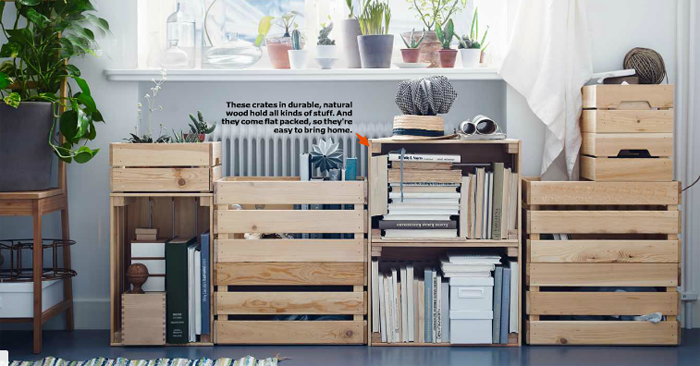 Not a new IKEA trick (we've reported this a few years back), but not with shelving in the mix. 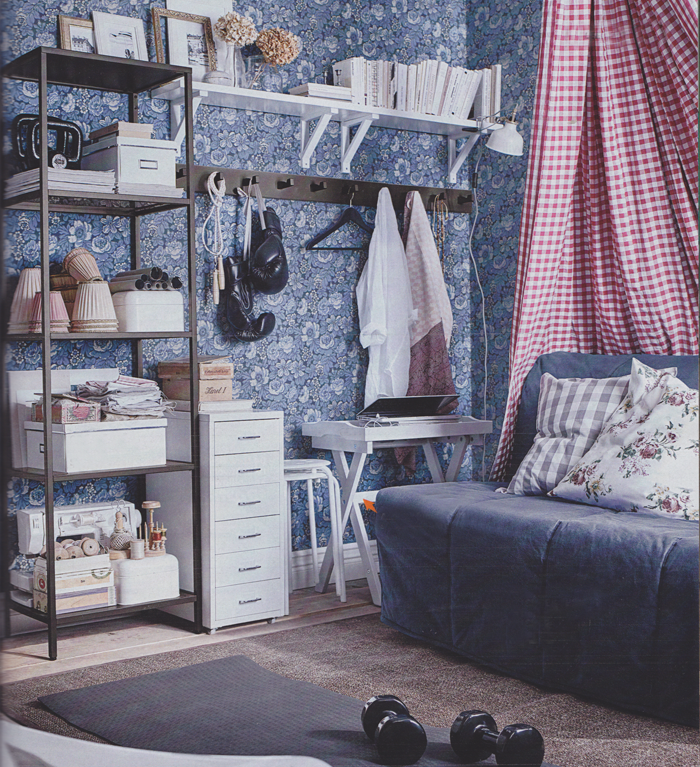 Put up floor to ceiling curtains, install shelving and create one side of a room (or nook) into a closet. 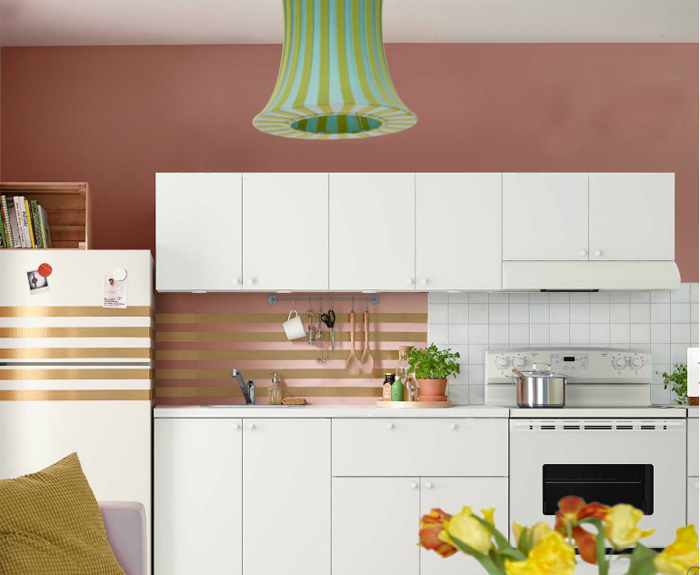 Make things look like they were meant to be together (or even one unit) by keeping things the same colour. Different shapes, even series look more cohesive by keeping them in the same hues. Add on as you need. 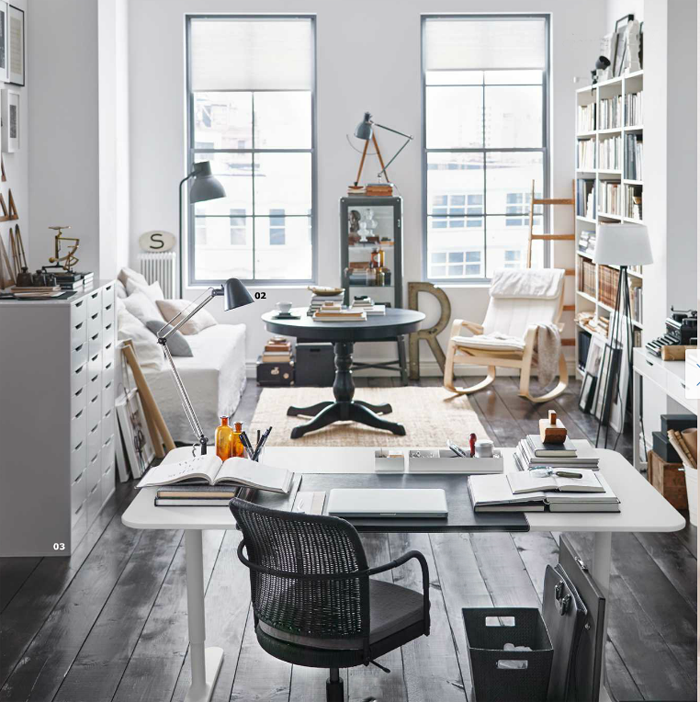 Draw the eye up by hanging art up high above doors and shelving. Just make sure there is something underneath, otherwise it will look super silly. Just a nice space to work. These KNAGGLIG boxes in natural wood make for a great way to hold all kinds of stuff. 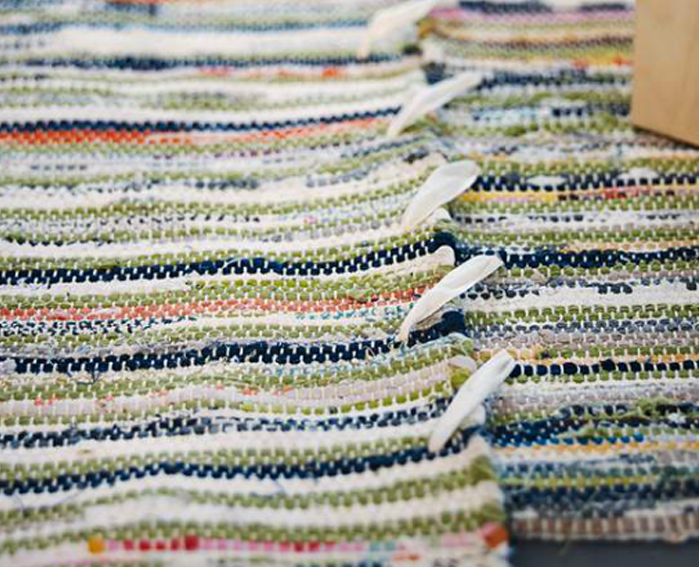 Make a big rug out of small rugs by stitching them together. 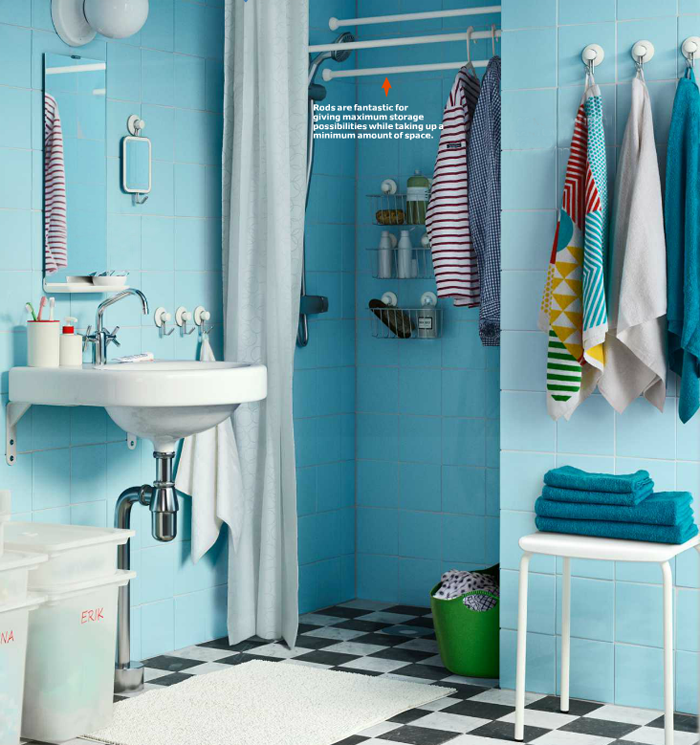 Create extra storage or a place to dry clothes by adding a shower curtain or two into the shower stall. 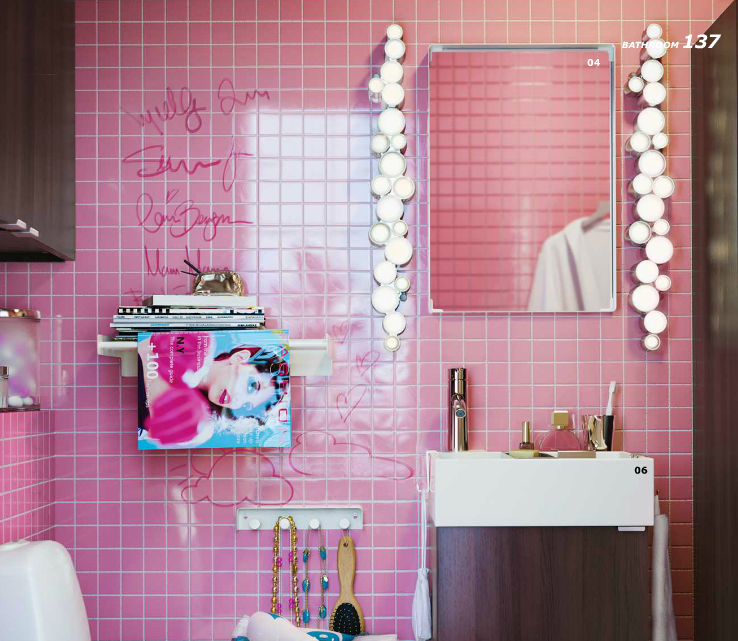 Love this pink tiled bathroom with lipstick graffiti! Plants make a space happy. Stay organized making things also handy with this shelf and caddy bar. Hold things you use often, like utensils or pencils, crayons, and scissors for homework. 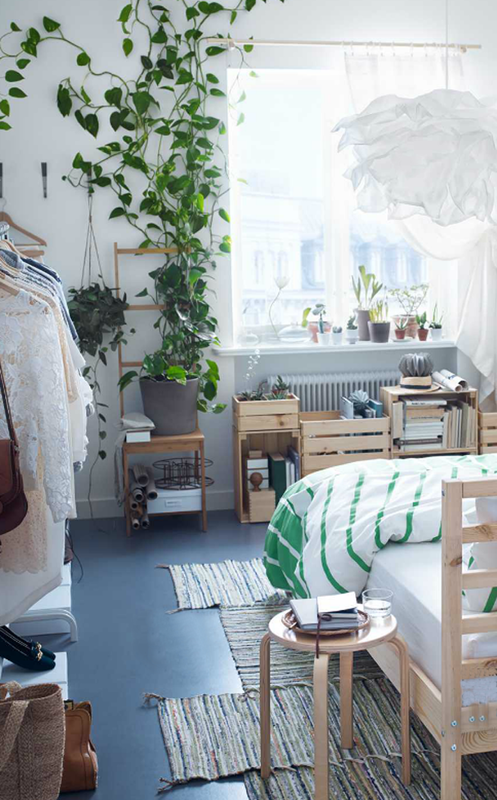 Click here to view the IKEA Catalog 2016 (US version). I'm so excited for the catalogue! I wish we could buy everything! 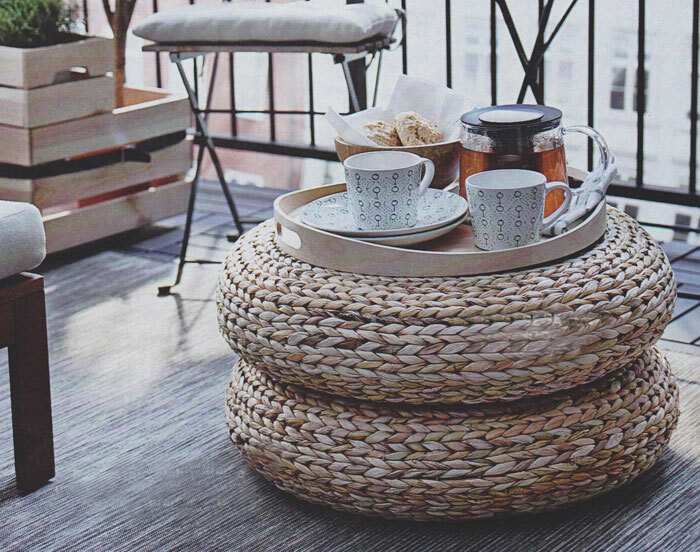 The balconies look great, and I love the canopy, perfect for kids! I can't wait for my catalogue to arrive. Great post! I'd love to try some of these! They always make it look amazing! 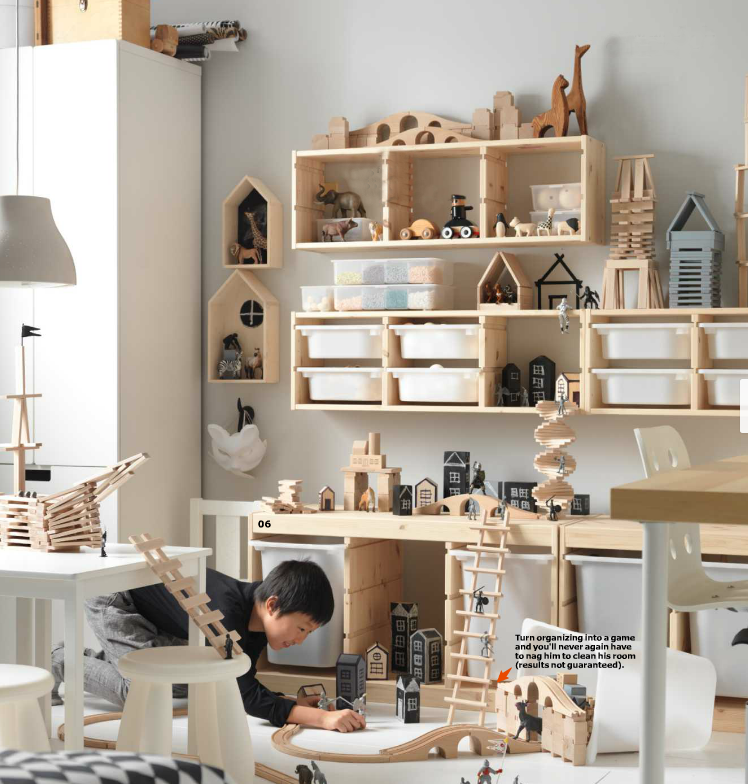 Re: Trick#4 -- I wish that ikea would make white boards to mix and match with cork boards. I want to do a wall above my desk just like this, but with white board/ magnet boards in there too! Thanks for reminding me how cool plants can be. I often use an expandable rod in the shower to dry clothes. I also don't have any doors on my bedroom closet by design after remodeling. Maybe one day sheers just tied back at either end (not even enough to actually close the opening) just for effect.